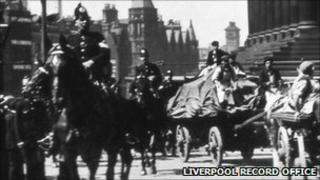 The recent scenes of police clashing with rioters, fires lit on city streets and hundreds appearing in court come as Liverpool marks the centenary of similar but far worse events. A transport workers strike in August 1911 led to crowds clashing violently with police at St George's Plateau. Two men were shot and killed by soldiers during three days of rioting. An exhibition at Liverpool's Walker Art Gallery - Art in Revolution: Liverpool 1911 - looks back at the events. The 1911 disturbances started on Sunday, 13 August when a demonstration by striking workers in support of a seamen's strike erupted into violence. The action began in Southampton when the National Amalgamated Sailors' and Firemen's Union made demands for improved conditions for their members and action then spread to other ports, including Liverpool. The union's demands were met in a few days and members returned to work, but in Liverpool the strike continued. Many local factories were shut and about 250,000 people were on strike. Sam Davies, Professor of History at Liverpool John Moores University, said: "This was the culmination of a number of months over the summer of 1911 when various groups had gone out on strike. "All of them were aiming for better wages, conditions and recognition of unions." Liverpool City Police, the forerunner of Merseyside Police, was reinforced with officers from other areas and soldiers from the Warwickshire Regiment were sent to the city. Gunboats were moored in the River Mersey. On 13 August, about 80,000 men and women marched to St George's Hall. Scuffles broke out between protesters and police and within minutes fighting had begun, involving hundreds of people. "The police attacked the crowd quite unnecessarily, many people were injured, many people were arrested, 186 people were hospitalised, and 96 people arrested," Prof Davies said. "This created a tremendous outcry in the city. "Two days and nights of rioting followed with troops on the streets, there were 3,500 troops stationed in Liverpool and a gunboat on the river." In 1911 it was customary for The Riot Act, which could declare gatherings of 12 or more people unlawful, to be read aloud to crowds. At St George's Plateau, the local stipendiary magistrate, Stuart Deacon, stood at the base of the Wellington Monument to read the act. Mounted police, charged the crowd while police on foot chased protesters across St George's Plateau and along neighbouring streets. In one street mattresses were dragged from houses and set alight to block the advance of police horses. By the following morning 96 people, many bandaged and bearing the scars of the riots, were appearing in courts charged with a variety of offences. On 15 August, prison vans containing 90 of those convicted for involvement in the riots were attacked as they made their way down Vauxhall Road to Walton Jail. The convoy was being escorted by 32 men from the cavalry unit the 18th Hussars, yet bottles and bricks were thrown at the soldiers and rioters grabbed the reins of the horses. The Hussars opened fire on the crowd and two men were killed. On the corner of Hopwood Street and Vauxhall Road, John Sutcliffe, 20, a carter, was shot twice in the head. A docker, Michael Prendergast, 29, was shot in the chest at close range by a soldier. Three other men suffered gunshot wounds during the fighting. The strike would last until 24 August when concessions were made because the rail strike was making it difficult for the government to contain the troubles. "They were running out of troops," Prof Davies said. "There were 50,000 troops mobilised across the country. On Saturday, 19 August two people were shot in Llanelli. "They didn't have railways to move troops around the country. When trouble happened in one town they couldn't get troops or extra police to that town because there were no trains running. "There was a realisation that they had to settle." Art in Revolution, which looks at the events of 1911, is on at Liverpool's Walker Art Gallery until 25 September, 2011.